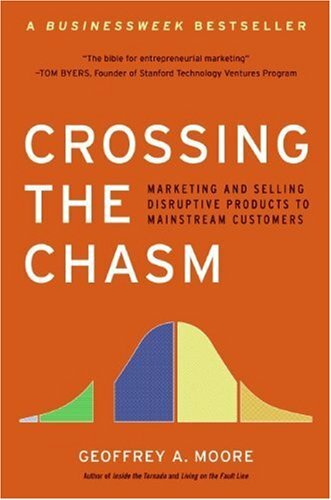 Recently I finished reading the book Crossing the Chasm (Geoffrey Moore, 2002, 227 pages), and it was a super interesting reading. First, because it is a great book, with many insights on how new products come to market on high-tech field (or fail to do so!). And this book is considered a “bible” on its segment. Secondly, because it introduced me to a whole new world, since on my ignorance I previously thought that marketing was equivalent to advertising. And it is obviously not. Marketing, at least when it comes to high-tech, means understanding the different types of users there are out there (early adopters, pragmatists, conservatives), and how and when they end up absorbing innovation. After going through such precious information, the book continues describing how to proper position a new product in order to make it into mainstream. Easier said than done, but these concepts are actually indispensable for someone who works with innovation, and I would go further saying that it could be really useful for all that work with new products in general and want to contribute to making their products successful. If you neither work with marketing nor with innovative products, this could still be an interesting reading for getting to know how you as a consumer react towards innovations and what the big players on this field are doing to grab your attention. Good reading!